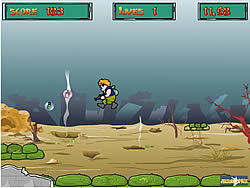 The aim of the game is to dodge the bombs being dropped on you from the enemy. Get hit by a bomb and you loose! Bombs also explode depending on what color bubble they are surrounded by so be careful not to be in close range of it or game over. See how long you can survive but more surprises await you as you get further in the game.